This gorgeous Victorian old world styled necklace is truly elegant. 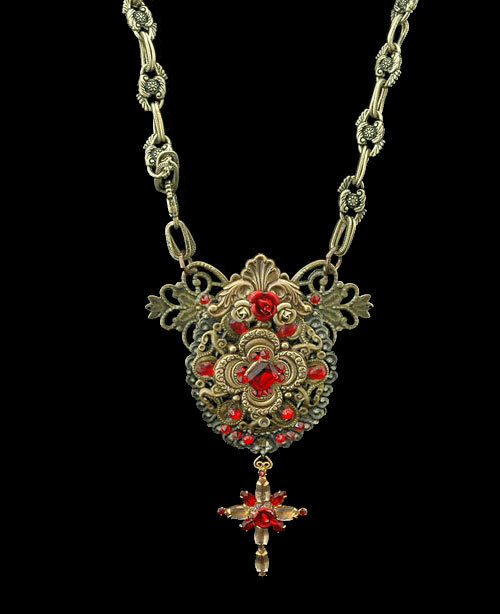 Layered with 5 different styles of vintage tooled brass antiqued gold filigree, and adorned with vintage jewelry findings, Swarovski crystals, crystal dust and tiny miniature antique gold & ruby red roses. An elegant rose detailed cross dangles below which finishes off this beautiful medieval design and compliments it perfectly. The Queens Jewels is suspended by an elaborate antique gold chain created from double oval rings with flowers between each. The chain Measures 22”, the pendant measures 4.25”L, 3” at it’s widest point. (Chains can be shortened or lengthened upon request). All crystals are either vintage Austrian or Swarovski.